This article by John Thomas Prabhakar, Lecturer of Physical Chemistry (Nanocrystals and Nanoparticles), was originally published on The Conversation. Read the original article. Though nanotechnology is portrayed as a fairly recent human invention, nature is actually full of nanoscopic architectures. They underpin the essential functions of a variety of life forms, from bacteria to berries, wasps to whales. In fact, tactful use of the principles of nanoscience can be traced to natural structures that are over 500m-years-old. Below are just five sources of inspiration that scientists could use to create the next generation of human technology. Complex slit architecture in the wings of the butterfly Thecla opisena. : Science Advances/Wilts et al, CC BY-NCThe colouration of several types of beetles and butterflies is produced by sets of carefully spaced nanoscopic pillars. Made of sugars such as chitosan, or proteins like keratin, the widths of slits between the pillars are engineered to manipulate light to achieve certain colours or effects like iridescence. One benefit of this strategy is resilience. Pigments tend to bleach with exposure to light, but structural colours are stable for remarkably long periods. A recent study of structural colouration in metallic-blue marble berries, for example, featured specimens collected in 1974, which had maintained their colour despite being long dead. Another advantage is that colour can be changed by simply varying the size and shape of the slits, and by filling the pores with liquids or vapours too. In fact, often the first clue to the presence of structural colouration is a vivid colour change after the specimen has been soaked in water. Some wing structures are so sensitive to air density in the slits that colour changes are seen in response to temperature too. In addition to simply deflecting light at an angle to achieve the appearance of colour, some ultra-thin layers of slit panels completely reverse the direction of the travel of light rays. This deflection and blocking of light can work together to create stunning optical effects such as a single butterfly’s wings with half-a-mile visibility, and beetles with brilliant white scales, measuring a slim five micrometers. In fact, these structures are so impressive that they can outperform artificially engineered structures that are 25 times thicker. 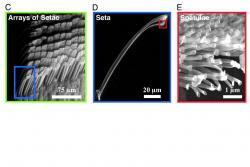 Micro and nanostructure of Gecko feet. : © 2005, The National Academy of SciencesGecko feet can bind firmly to practically any solid surface in milliseconds, and detach with no apparent effort. This adhesion is purely physical with no chemical interaction between the feet and surface. The active adhesive layer of the gecko’s foot is a branched nanoscopic layer of bristles called “spatulae”, which measure about 200 nanometers in length. Several thousand of these spatulae are attached to micron sized “seta”. Both are made of very flexible keratin. Though research into the finer details of the spatulae’s attachment and detachment mechanism is ongoing, the very fact that they operate with no sticky chemical is an impressive feat of design. Gecko’s feet have other fascinating features too. They are self-cleaning, resistant to self-matting (the seta don’t stick to each other) and are detached by default (including from each other). These features have prompted suggestions that in the future, glues, screws and rivets could all be made from a single process, casting keratin or similar material into different moulds. The strongest form of any solid is the single crystal state – think diamonds – in which atoms are present in near perfect order from one end of the object to the other. Things like steel rods, aircraft bodies and car panels are not single crystalline, but polycrystalline, similar in structure to a mosaic of grains. 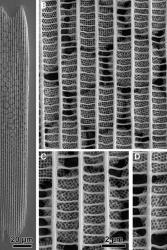 So, in theory, the strength of these materials could be improved by increasing the grain size, or by making the whole structure single crystalline. Single crystals can be very heavy, but nature has a solution for this in the form of nanostructured pores. The resultant structure – a meso-crystal – is the strongest form of a given solid for its weight category. Sea urchin spines and nacre (mother of pearl) are both made of meso-crystalline forms. These creatures have lightweight shells and yet can reside at great depths where the pressure is high. In theory, meso-crystalline materials can be manufactured, although using existing processes would require a lot of intricate manipulation. Tiny nanoparticles would have to be spun around until they line up with atomic precision to other parts of the growing mesocrystals, and then they would need to be gelled together around a soft spacer to eventually form a porous network. Magnetotactic bacteria posses the extraordinary ability to sense minute magnetic fields, including the Earth’s own, using small chains of nanocrystals called magnetosomes. These are grains sized between 30–50 nanometers, made of either magnetite (a form of iron oxide) or, less commonly, greghite (an iron sulphur combo). Several features of magnetosomes work together to produce a foldable “compass needle”, many times more sensitive than man-made counterparts. Though these “sensors” are only used for navigating short distances (magnetotactic bacteria are pond-dwelling), their precision is incredible. Not only can they find their way, but varying grain size means that they can retain information, while growth is restricted to the most magnetically sensitive atomic arrangements. However, as oxygen and sulphur combine voraciously with iron to produce magnetite, greghite or over 50 other compounds – only a few of which are magnetic – great skill is required to selectively produce the correct form, and create the magnetosome chains. Such dexterity is currently beyond our reach but future navigation could be revolutionised if scientists learn how to mimic these structures.